Follow Ann and Jim as they search for Ann's father who has been imprisoned inside hollow Earth. Many dangers await them and it's up to you to help guide our two heroes to safety. 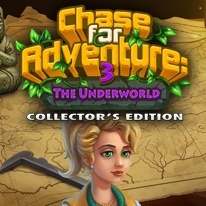 You'll encounter ancient artifacts, a gallery of photograph, and craft interesting items to complete each level. Hurry before it's too late!